This new 8th edition incorporates changes from the "America Invents Act," as well as recent revisions to patent rules and regulations. Thousands of people have used Patent Pending in 24 Hours successfully. You can, too! -Andrew Bergman, Inventor of "Pick me up Dolly"
Detailed instructions and examples on how to draft and assemble a "Provisional Patent Application" are the main feature of this product. However, since each application will be unique, a "blank" application is not included in the book. Hurdle #1: Is It Commercial? Hurdle #2: Did You Invent It? Hurdle #3: Do You Own It? Hurdle #4: Is It Useful? Hurdle #5: Does It Fit in One of the Patent Classes? Hurdle #6: Is It New? Hurdle #7: Is It Obvious? What Do You Call Your Invention? What Are the Names and Addresses of the Inventors? What Are the Advantages of Your Invention Over the Prior Art? What Drawing Figures Have You Included? What Are the Components of Your Invention and How Do They Interact? Operation—How Does the Invention Achieve Its Result? What Are Alternative Ways That Your Invention Can Achieve Its Result? What Happens If You Modify Your Invention? Congratulations—you invented something! So what’s next? If you’re like most inventors, your first concern is to make sure nobody can steal your great idea. There used to be only two foolproof ways to lock in a claim of invention ownership. One way was to build and test the invention and to keep a solid record of the inventing process (usually accomplished with a properly witnessed and dated notebook). Unfortunately, building and testing an invention, unless it’s very simple, is beyond the capability and budget of most inventors. The second method for claiming ownership was to get a patent. A patent gives you the right to prevent others from making, using, or selling your invention for a limited period of time. But this protection comes at a price: You can expect to spend anywhere from $5,000 to $15,000 or more to file a patent application through an attorney. And because fewer than 3% of all patented inventions ever make any money, you might never see a return on your investment. This puts some inventors in a bind: If they don’t file for a patent right away, someone else might steal their idea. But if they file too soon, they risk spending money on legal protection for an invention that may not be commercial. Wouldn’t it be great if there was an inexpensive way to establish an official claim to your invention before filing for a patent—so you could figure out whether your invention would turn a profit before you pay to protect it? Well, there is—the provisional patent application. In this chapter, we’ll explain the benefits—and the disadvantages—of filing a provisional patent application. To give you an idea of what a provisional patent application looks like, we’ve also included two examples in the last section of this chapter, one based on William Lear’s car radio, and the other based on Louis Pasteur’s process for improving beer and ale (later to be known as “pasteurization”). After reading this book, you may decide that the provisional patent application is not for you. You may determine that your invention lacks commercial potential or is not patentable. Regardless of whether you ultimately file a provisional patent application, this book will help you see your invention in a wider context—in relation to patent law, licensing opportunities, and other inventions within your field—rather than just as an isolated creation on your workbench. In 1995, President Clinton signed a law that allowed inventors to file a provisional patent application. This process offers an effective, fast, and cheap way to safeguard your place in line at the United States Patent and Trademark Office (USPTO) for up to one year until you file a regular patent application. A provisional patent application (sometimes referred to as a PPA) consists of text and drawings that describe how to make and use your invention. It’s a short document—often five to ten pages—written in plain English, with none of the arcane language used in regular patent applications. In fact, if you’ve written a technical article that accurately describes how to make and use your invention, you can submit that as part of your application. You do not need to hire a draftsperson to prepare formal drawings; you can furnish informal drawings as long as they—in conjunction with your written statement—show how to make and use your invention. You can either send your description, drawings, a return postcard, and a cover sheet and fee transmittal form to the USPTO by USPS Priority Mail Express (along with the fee—$140 for small entities or $70 for micro entities—discussed later), or you can transmit the materials electronically with a credit card charge authorization (as we’ll explain in Chapter 6). Once this is done, you have established an effective filing date for your invention and you can use the term “patent pending” on your invention—at least for 12 months from the filing date. A PPA will not, by itself, get you a patent. In order to patent your invention and obtain some of the benefits listed above, you must file a regular patent application—a more complex document—and the application must be approved by the USPTO. The provisional patent application is a simple, inexpensive strategy for preserving your rights while you decide whether to file for a regular patent. But if you want that patent, you will have to file a regular application within a year after you file your provisional application. What If You Don’t File Your Regular Application on Time? You won’t automatically lose patent rights if you fail to file a regular patent application within a year after you file the provisional application. But you will lose the benefits we describe in this chapter—for example, the earlier filing date and the right to claim “patent pending” status. Under the first-to-file patent law, effective March 16, 2013, if you file a regular patent application for an invention whose provisional patent application has “expired,” you will not be entitled to the benefit of the filing date of the PPA. If the invention has been publicly disclosed or offered for sale, this will prevent you from filing a regular patent application after the public disclosure or offer for sale, unless the disclosure or offer for sale was made by you or someone acting for you and it was made less than one year before the filing date of the regular patent application. However, as a general rule, it’s best to avoid any disclosure prior to the filing date. Patent It Yourself. Some readers may find it helpful to use David Pressman and David E. Blau’s Patent It Yourself (Nolo) as a companion resource while using this book to prepare their provisional patent applications. In 2002, the Court of Appeals for the Federal Circuit (CAFC)—the federal appeals court that specializes in patent cases—issued an important ruling involving provisional patent applications. The case, New Railhead Mfg. Co. v. Vermeer Mfg. Co. & Earth Tool Co., App. No. 02-1028 (7/30/02), involved two patents: one for a drill bit for horizontal directional drilling of rock formations and the other for a method of horizontal directional drilling. Both patents claimed the filing date of a provisional patent application. The lawsuit occurred when New Railhead Manufacturing, the company that owned the patents, pursued a company it believed was infringing. At the heart of both patents was an invention in which a drill bit was angled with respect to its housing (known as a “sonde housing”) and operated at a specific heel-to-toe ratio. The CAFC ruled that the underlying provisional patent application failed to adequately describe the angled structure of the drill bits, and therefore, the company that filed the patents could not get the benefit of the provisional filing date. The court wrote, “The provisional [patent application] never states that the drill bit is angled with respect to the sonde housing, does not mention or describe the toe or the heel, and does not mention or define the heel-toe ratio.” Unfortunately, New Railhead Manufacturing had made offers for sale prior to filing its provisional applications and as a result of the one-year-sale rule, both patents were invalidated. The New Railhead case reinforces the principles described in this chapter: If you want the benefit of the provisional filing date for a later patent, your provisional application must describe the invention in such full, clear, concise, and exact terms as to enable any person skilled in the art to make and use it. If you leave out an element of your invention, fail to explain all of the operating elements, or if your later patent application adds new matter, you won’t be credited with the earlier filing date. If, after preparing your provisional patent application, you are in doubt as to whether it meets the legal requirements, seek the advice of a patent professional. Information about locating an attorney can be found in Appendix E.
The USPTO issues three types of patents—utility patents, plant patents, and design patents. Utility patents protect what we commonly think of as “inventions.” When we use the term “patents” in this book, we are always talking about utility patents, unless otherwise noted. An invention can be virtually anything that’s functional. Utility patents protect a broad range of inventions: mechanical devices, medical procedures, chemical formulas, methods of doing business, software programs, animal and plant life, and improvements on past inventions. Your invention must be new. The USPTO grants patents for new (or “novel”) inventions only. Your invention isn’t new if someone previously invented it, patented it, or wrote about it prior to your filing date. There is an exception, however, if you (the inventor) or anyone who obtained the subject matter from you made certain disclosures of the claimed invention within a limited one-year grace period prior to filing. A patent is a “license to sue.” If you get a patent, you can stop others from making, selling, or using your invention for 17 to 18 years. Think of your patent as a “hunting license”—one that gives you the right to sue infringers for damages and other legal remedies. You can take up to a year to assess whether your invention will sell before committing to the higher cost of filing and prosecuting (the official term for “pursuing”) a regular application for a patent. You can use the “Patent Pending” notice to deter others from copying your invention. You establish an official U.S. patent application filing date for the invention. Your application is preserved in confidence. The expiration date of your patent will effectively be extended, if the USPTO later approves your application. We discuss each of these benefits in detail in the sections that follow. Alexander Graham Bell almost didn’t get the patent for the telephone. On the day that he filed his patent application, a rival inventor, Elisha Gray, filed for the same invention. Historians attribute Bell’s victory at the USPTO to several factors, the most important of which was that Gray never bothered to fight for the patent. Gray, a businessman, didn’t believe that the telephone had any commercial potential and filed his patent documents as an afterthought. He believed (as did his business partners and attorneys) that the telephone was a novelty not worth pursuing. But it’s unfair to judge Gray harshly in hindsight. Determining the commercial potential of an invention can be difficult—sometimes even impossible—until you’ve actually tried to sell it. Considering that fewer than 3% of all patents ever make money, the vast majority of inventors probably shouldn’t bother with the time and expense of filing a patent application. Unfortunately, there’s no accurate way to predict whether any invention will fall into that lucky 3%. What if the invention is a commercial success but no patent protects it from being stolen by others? Inventors dutifully prepare and file patent applications as insurance against this possibility. Once you file the provisional patent application, you will have almost a year to assess the commercial potential of your invention before you have to prepare a patent application. That should be enough time to make a preliminary assessment about commercial potential. If everybody you’ve shown it to says “no thanks” and backs away from you slowly, there’s probably no reason to bother filing a regular patent application. Oops! As you know by now, the provisional patent application does not, by itself, get you a patent; it merely provides a placeholder or a record of your invention that you can rely on—at least for 12 months—to support a regular patent application. But misconceptions about provisional patent applications reappear with such frequency—even in newspapers—that a lot of inventors believe them. It’s no wonder that scam invention promotion companies can prey on unknowing inventors by claiming that a provisional application will get you patent rights. The USPTO website (www.uspto.gov) and the Federal Trade Commission website (www.ftc.gov) both offer tips on how to avoid disreputable invention promotion companies. There’s a certain cachet to labeling your invention “patent pending” or “patent applied for.” Putting those words on the bottom of your invention or in an advertisement sends a message that you’ve filed an official claim on the invention. This marking often deters manufacturers from stealing your invention—they do not want to pay for creating tooling or molds to produce the invention if they know you may get a patent for it. Keep in mind that marking your invention “patent pending” doesn’t give you any patent rights. You cannot stop anyone from copying, selling, or using your invention during this period. Patent rights do not kick in until after your regular patent application is approved. The label simply lets the world know that you have staked a patent claim and are waiting for the patent to issue. As we explain in “Preserve Your Application in Confidence,” below, under certain circumstances—you may be able to sue for damages during part of the pendency period. Filing a provisional patent application gives you an official patent filing date. Under the current patent system (as of March 16, 2013) the United States rewards the inventor who is first to file (FTF) with a patent. In other words, the inventor with the earliest official filing date wins the patent. The filing date is also important for another reason. If your patent later issues, it becomes part of the prior art against which other patent applications are judged. The date your invention becomes prior art (known as the “102(e) date” because it references 35 U.S.C. § 102(e) of the patent law) is the date you filed your provisional patent application. Other inventors who try to patent the same invention must prove that they invented their creation before the 102(e) date of your invention. EXAMPLE: Bob files a provisional patent application on April 1, 2018. He then waits a year and files his regular patent application on March 1, 2019. The USPTO later issues him a patent. Sam invents a mobile telephone switching system identical to Bob’s invention but he doesn’t file until April 10, 2018. Bob’s provisional patent application will be considered prior art and can be used to block Sam’s application. The provisional patent application guards your secrecy while preserving your rights at the USPTO. Nobody at the USPTO will read your provisional patent application unless you file a regular application within 12 months and you need to rely on the date of your PPA because a dispute arises with another inventor as to your rights (or the PTO cited a reference against your patent application that has an effective date earlier than your regular patent application but not earlier than your PPA). Otherwise, the PTO will never even read your PPA and it will sit safely tucked away in the PTO’s files. According to inventors’ lore, you can prove the date of your invention by describing your invention and mailing a copy of the description to yourself—that is, by certified or registered mail. Supposedly, the postmark on the sealed envelope proves your date of invention. Our advice—Fuggedaboudit! The courts and the USPTO refuse to accept such so-called “post office patents” as evidence of patent priority. In addition, the date of invention became largely irrelevant after March 16, 2013, when the United States adopted a first-to-file patent system. If you file a regular patent application, the USPTO will treat that application with secrecy for the first 18 months of the examining process. Approximately 18 months after you file your regular patent application, the USPTO will publish your application (unless you requested nonpublication at the time you filed). Publication can be a good thing. It paves the way for you to sue later (after you get your patent) for infringements that occurred after the patent is published. On the other hand, it can be a bad thing if your secrets are released, but your patent isn’t granted. Your patent expires 20 years after the date you file your regular patent application. However, you don’t get 20 years of patent rights. Because the USPTO takes approximately 12 to 36 (or more) months to complete the examination and because you don’t get any rights until the patent actually issues, most patent owners will have only 17 to 18 years of patent rights. That’s unfortunate because many inventions enjoy their best commercial returns during the final years of their patents. Filing a provisional patent application can stop the clock for at least a year on patent examination. Your 20-year term starts from the date you file your regular patent application, not your provisional patent application. So your patent rights, if the patent issues, end one year later than they would have if you filed a regular patent application instead of a provisional. EXAMPLE: Loren files a regular patent application on March 1, 2018. If her application is approved, the patent will expire on March 1, 2038. If Loren files a provisional patent application for her invention on March 1, 2018 and then waits a year to file her regular patent application, the resulting patent will expire on March 1, 2039. Unlike a regular patent application (that must be filed in English), a provisional patent application can be filed in any language. Like their U.S. counterparts, the foreign inventor can obtain the earliest possible prior-art date—the date against which competing patent applications will be judged. If the foreign inventor files the provisional patent application and the home country patent application at the same time, the foreign inventor—like the U.S. inventor—can preserve ownership rights in the United States and extend the life of the U.S. patent, as discussed in the previous section. After reading about all of the advantages we’ve described, you’re probably ready to get down to work on your provisional patent application. But before you do, there are some potential drawbacks you should be aware of. If your provisional application fails to explain how to make and use your invention in “full, clear, concise, and exact” terms, you can’t count on it for any of the purposes described in this chapter—for example, an early filing date, proof of invention, or constructive reduction to practice. Leaving out an element of your invention or failing to explain all of the operating elements could be fatal inaccuracies. Other inaccuracies include using faulty supporting data or drawings that don’t match the written description. Deliberate inaccuracies will also destroy your patent hopes—for example, if you are not the true inventor or you filed even though you knew the invention did not qualify for a patent. If you modify the manner in which your invention operates or add any new technical information that was not in the provisional application (known as “new matter”), you cannot rely on the date of the provisional patent application for such new matter. You can file a new provisional application that reflects these changes. Adding, subtracting, or modifying parts, or changing the structure or operation of the parts would all qualify as modifications. You will not be able to rely on your provisional patent application date for these new developments. You must file patent applications in any country in which you seek protection within one year of your provisional patent application’s filing date. If you fail to file for foreign patent protection within one year of that date, you will lose any right to obtain the benefit of your provisional patent application’s filing date in foreign countries. If you miss the one-year deadline, you can still file in foreign countries—provided you have not sold, publicly used, or published your invention before the foreign filing date. This could be a problem if, during the period between your U.S. and foreign filing, someone else filed for a similar invention. Since the United States accounts for one-quarter to one-third of all sales for most patented inventions, many inventors are not interested in pursuing foreign patent rights. However, if you think that a foreign manufacturer may want licensing rights, it’s generally a good idea to preserve your foreign patent rights. We discuss foreign patents in more detail in Chapter 6. 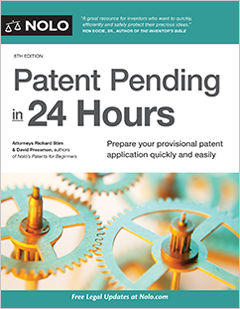 Believe it or not, you really can get your provisional patent application on file within 24 hours, as promised in the title of this book. But your overriding concern should not be speed; it should be accuracy. How fast you prepare and file your provisional patent application will depend on your knowledge of patent law, your familiarity with inventions similar to yours, and your ability to accurately describe your invention. accurately describe how to make and use your invention. That’s a tall order and we’ve only got about 23 hours left, so we’d better get started. But before we do, here are examples of provisional patent applications for two historic inventions. We made these up to give you a sense of what a provisional application should look like. If you like drinking beer or listening to the car radio, you can thank Louis Pasteur and William H. Lear. There were no provisional patent applications available when these men created their inventions—both Pasteur and Lear filed regular patent applications to preserve their rights. In order to give you an idea of how simple it can be to draft a provisional patent application, we have reduced these two patents to provisional applications. The full text of each patent is included in Appendix A so that you can compare these with the real patents. We’ve included the original patent drawings with each provisional patent application but, as we explain in Chapter 4, you can furnish less-formal drawings. You will find more examples of provisional applications of famous (and not-so-famous) inventions in Appendix A. Provisional patent applications are not examined on their merits. The date of a provisional patent application cannot be claimed if a regular patent application has not been filed within one year. A provisional patent application cannot claim the benefit of an earlier application (foreign or domestic). The disclosure of a provisional patent application must be clear and complete enough so that an ordinary person skilled in the field of the invention can make and use the invention. All contributors to the inventive subject matter of the provisional patent application must be named in the provisional patent application. The regular patent application must name at least one inventor who was named in the provisional patent application. In order for a regular patent application to claim the date of the provisional patent application, the provisional patent application must be filed with the proper fee and must be complete. If the basic fee is not paid with the provisional patent application, the fees can be paid later, but the PTO charges a penalty fee. Provisional patent applications are not available for designs. No subject matter can be added once the provisional patent application is filed. No patent will result from the provisional patent application unless a regular patent application is filed within a year or the provisional patent application itself is converted to a regular patent application. Background: Prior to Louis Pasteur’s invention, the production of beer was hindered because the boiled extract or seasoned hop (known as “the wort”) was exposed to air. That exposure affected the quality and amount of beer produced as well as the stability of the beer—that is, how fast it spoiled. Pasteur discovered that by preventing exposure to air, a larger quantity and better quality of beer could be produced. Pasteur’s process—later known as pasteurization—partially sterilized the beer and subsequently was used to sterilize liquids such as milk and orange juice, as well as cheese. His improvement in Brewing Beer and Ale was patented in France in 1871 and in the United States in January 1873. I discovered a better way to brew beer and ale. My process prevents the wort (the boiled extract of malt or material seasoned with malt or other qualifying ingredient seasoned with hops) from exposure to air. The result—compared to existing methods of beer production—is the production of a larger quantity of beer as well as a beer that is more aromatic and less likely to deteriorate in transit or storage. I accomplish this by expelling the air from the boiled wort while it is confined in a closed vessel (or vessels). The attached drawing helps to explain my invention. Three casks AAA (Fig. 1), made of iron, wood, or other suitable materials, are supported on stands below a water pipe E. The water pipe has branches, each with a valve, and at the end of each branch, a flexible hose and spray nozzle P. On another stand T is an apparatus MM that generates carbonic-acid gas. The carbonic gas is supplied to the casks and is released from the casks at the escape tubes x which extend into cups or chambers v from which the gas can be collected by a gasometer. The wort is prepared in the usual manner and while boiling hot is placed in a cask. Carbonic-acid gas is conveyed into the cask for the purpose of expelling air. There must be a thorough penetration of carbonic-acid gas into the liquid to expel all contained air. Then, the water pipe sprays the cask to cool it. A trough c is placed below the casks to collect the water. As the temperature is reduced to about 20 to 23 degrees Celsius (68–73 degrees Fahrenheit), the yeast or fermenting material is added to induce fermentation. After first fermentation, the beer can be sent through the valves R into casks or barrels for future use. The beer does not have to be removed and fermentation can be completed in the cask. But in this case, a small quantity of air may be drawn into the cask to speed fermentation. The air drawn into the tube should be filtered through cotton or passed through a hot tube to kill or extract any germs that it may contain. The apparatus shown is adapted for making small quantities of beer but the capacity may be varied quite easily. Background: If you like to listen to music in your car, you can thank William Lear who, with his friend Elmer Wavering, coinvented the first car radio in 1930. Unable to afford a booth fee to show their product at an automotive trade show, Lear and Wavering parked outside the convention center, played their radio, and took orders in the parking lot. Lear’s company sold the radio device under the trademark Motorola—combining “motor” and Victrola—and it was an instant hit. But for Lear, that was only the beginning—he went on to invent the eight-track tape format and navigation aids for aircraft. He later founded Lear, Inc., the supplier of the Lear jet. I have invented a new radio receiver that is portable and can be used in automobiles and other similar vehicles. It can be operated by a remote control that can be located within easy reach of the operator. In automobiles, considerable vibration and jerking occurs. In the usual radio there are variable condensers or capacitors. These are usually mounted so that their axis is horizontal during normal operation. Such condensers are particularly sensitive to the vibration and jerking, resulting in a change of adjustment. I have determined that this can be eliminated by disposing the gang condenser so that its shaft is in a vertical position. This will enable practically all the jars and bumps to be taken up by the bearings of the condenser and eliminate or reduce any tendency to throw the condenser out of adjustment. Also, the vertical position enables the remote control apparatus to be streamlined. Practically all of the remote controls used on such sets make use of a flexible cable, which must be connected to the condenser’s shaft. The vertical mounting makes it possible to minimize the number of sharp bends and turns in this cable. Also, when the radio is mounted in the vehicle, it must be protected from water, sand and other elements to which anything suspended underneath an automobile is exposed. To provide such protection, I provide a container, preferably metallic, for shielding purposes. I permanently fasten the container to the automobile, preferably hanging it from the bottom of the floorboards. I mount the radio as a unit on a chassisin this container. This makes it easy to replace the vacuum tubes and service the radio. as desired, without endangering the protection afforded by the casing. The drawing shows a radio set embodying the above concepts and mounted in an automobile. Suspended underneath the automobile’s floorboards, through a suitable aperture, is a metal casing 1. It contains the radio receiving set 2. This set includes the usual elements, such as rf transformers, vacuum tubes, tube sockets, and the like. It also includes a tuning element, a gang condenser 3. The gang condenser has a rotor 4, rigidly mounted on a shaft 5. The entire radio is mounted on a chassis 6 and can be removed as a unit from casing 1 upon the removal of cover 7. The condenser is mounted so that its rotor shaft 5 is vertical when the set is installed in the automobile. To operate condenser 3, a pulley 10 is rigidly fastened to the upper portion of its rotor shaft 5. Pulley 10 has a pin 11, to which is anchored one end of a coil spring 12. The other end of the coil spring is anchored to a fixed portion of the set, so that there will be a tendency for the condenser to assume a position of either minimum or maximum capacity. I have shown it in the maximum position. Pulley 10 is also provided with an anchor block on its edge. One end of a cable 16 is anchored to the anchor block. This cable is positioned in a groove 17 in the periphery of pulley 10 and extends out through the side of casing 1. Cable 16 is in a sheath 17, and the entire assembly leads to a control unit 20, here mounted on the steering column of the car. The control unit has a control knob 21 for moving cable 16 lengthwise. By actuating knob 21, the driver may adjust rotor 4 in any desired position with respect to the fixed plates of condenser 3. To energize the set, suitable connections are made to current supplies—the automobile storage battery and a separate battery for the plates or anodes of the vacuum tubes. A cable 25 leads to a combined volume control and switch 26 of control unit 20. From the control unit a pair of cables 27 and 28 lead to a socket 29, rigidly fastened in the bottom of casing 1. Socket 29 is tightly sealed in casing 1 so that no water or dirt can enter the casing. A cooperating plug 30 is mounted on chassis 6 so as to mate with socket member 29 when the chassis is in the normal position in the casing. Various wires from plug 30 go to the several pieces of apparatus in the radio. When the radio chassis is removed from casing 1, plug 30 is automatically withdrawn from socket 29. Chassis 6 is rigidly mounted in casing 1 by suitable hardware (not shown). To see if someone could actually accomplish the filing within 24 hours, we asked an inventor to time himself as he went through the paces. Our inventor, an experienced toy designer, has licensed many toys in his 30-year career but had never prepared or filed a provisional or regular patent application. At the end of each chapter, we’ll discuss any problems he encountered. The subject of our time trial is a method of simulating tears in a doll (that we’ll call Baby Tears) using LEDs (light emitting diodes). Our inventor is not claiming rights to any electrical or LED technology related to Baby Tears, only to the new use of the LED technology within a “crying” doll. So far, our inventor has spent 45 minutes reading this chapter and considering issues about trade secrecy and publication. Okay, there are only 23 hours and 15 minutes left!